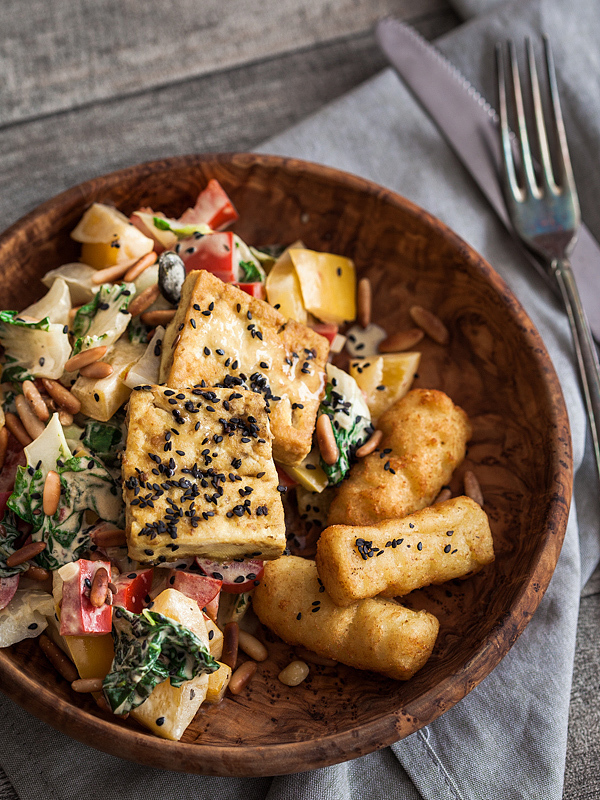 Well then, do you have some tofu left even after after my latest two recipes, Tofu Gnocchi Bowl and Crunchy Tofu? Here’s some good news for you. There’s more to come as I ADORE tofu and its variety. How about some ‘germanised’ tofu with lovely fried vegetables in a mustard sauce? And don’t forget the potato croquettes that I found in the depths of my freezer. That day I was really desperate to get some carbs as I was craving them so badly! Those croquettes came to my rescue and I don’t regret anything. The tofu and the veggies however make a great dish just for themselves and should satisfy you fully even without the fried carbs of doom. I prepared the veggies and the tofu each in a separate pan. It's just easier that way as the tofu can fully soak in the mustard marinade like that. Start with dicing the vegetables and mincing the garlic and ginger. Add oil to a heated pan and fry your vegetables until al dente. Pour the sauce into the pan and let it simmer until it thickened a bit. Fry some pine seeds in a pan and garnish your vegetables with them. To make the tofu as crunchy as possible press it between two paper towel covered cutting boards for about 20 minutes to drain it from excess water. Heat oil in a pan and bake the tofu in it until it's golden brown from both sides. Turn the heat down to a low setting and add the marinade (sesame oil burns rather quickly, so make sure the pan is not too hot anymore). Let it boil down for a while until the tofu has absorbed most of the sauce. Sprinkle with sesame and serve immediately. The project From my Fridge is an attempt towards a more sustainable lifestyle that aims at the reduction of food waste, more creativity when dealing with leftover food and a raised awareness for the usage of our resources.